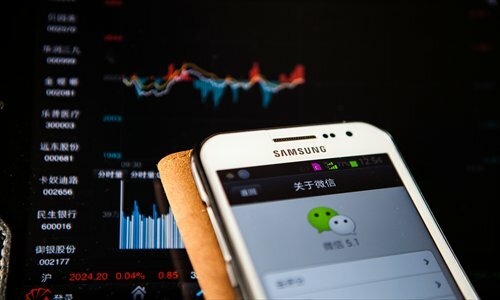 Tencent Holdings Ltd quietly rolled out its first financial services product for its mobile messaging app WeChat on Thursday to compete against similar offerings from rivals Alibaba Group Holding Ltd and Baidu Inc.
Tencent teamed up with China's Huaxia Bank Co to offer the product via its three-year-old WeChat messaging app, which boasts 272 million global monthly active users. The service was released on a limited basis and is not available to all users. The product, called Licaitong, is said to be able to provide interest rates at 16 times more than the central bank's benchmark one-year deposit rate for money deposited in the fund. The advertised annualized interest rate on Thursday afternoon was 6.4350 percent. Tencent officials acknowledged the release of Licaitong but declined to provide further comment. China's finance sector has been dominated by State banks for decades, but technology companies are using their online expertise and platforms to push financial products developed by financial management firms. Tencent, Baidu and Alibaba have pushed to obtain licenses to build financial services platforms, offering Web users mutual funds, loans and insurance. Electronics retailer Suning Commerce Group Co also got the go-ahead last October for a subsidiary to handle online mutual fund sales. Many of the services are being integrated with the companies' online and mobile platforms as part of their online-to-offline strategies. They are encouraging users to use their platforms to shop, manage finances and book taxis. Alibaba-affiliated money market fund Yu'ebao, which translates to "leftover treasure," is a collaboration between its online-payment affiliate Alipay and Tianhong Asset Management Co. The fund has attracted 43 million customers and more than $30 billion in assets under management as of December since its launch last June. In October, Alipay bought a controlling stake in Tianhong. Alibaba also has partnered with Tencent and Ping An Insurance Group to offer online insurance products. Baidu joined forces with China Asset Management Co when it launched its Baidu Finance Center in October. In December, China's central bank said it would closely monitor the development of Internet financial services to ensure companies do not cross any legal boundaries in China's highly regulated financial market.